ROTANA’S first property into the Kingdom of Bahrain has been keeping busy since its opening in March 2013. The Majestic Arjaan by Rotana, located in the Busaiteen district on the island of Muharraq, caters to both business and leisure guests. It features 128 suites consisting of studios, one, two and three bedrooms developed as duplexes, increasing Rotana’s inventory to more than 12,620 rooms in the region. With the opening of this hotel, Rotana now operates 11 properties under the ‘Arjaan Hotel Apartments by Rotana’ brand. Rotana currently manages a portfolio of 85 properties throughout the Middle East & Africa. Other features at the hotel include fully-equipped meeting rooms, an outdoor temperature-controlled swimming pool, a full-fledged fitness centre, with steam and sauna rooms as well as three specialised food and beverage venues – Ginger All Day Dining, lobby café Ginger Lounge and casual dining Aquarius. 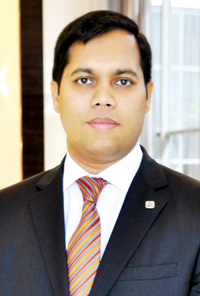 TTN spoke to general manager Raiz Saban on how the hotel has been faring since its opening. How has the property fared since its opening? Majestic Arjaan by Rotana has witnessed a steady growth in occupancy level. Its 128 suites achieved an occupancy rate of 52 per cent in less than three months, with most weekends running at full occupancy, signifying its popularity among both vacationers and professionals during their visit to Bahrain. How has the hotel been positioned in the market? The opening of Majestic Arjaan by Rotana represents an important achievement for Rotana, and a major milestone in our strategy to expand further in the region. This is our first property in Bahrain, a fascinating city with an attractive liberal lifestyle, a rich history and culture, with a strong demand for luxury hotels that offer world-class hospitality. We have, and continue, putting all our efforts to drive the business to the property through our sales and marketing force and we are extremely pleased to see the property’s high performance and positioning as one of the top hotels in Bahrain. Travellers, whether for business or leisure, greatly appreciate the product we have introduced in Bahrain. Have you been able to sustain RevPar, if not, how much has that been affected? We have a strong sales and marketing strategy and we entered the city with the right rate. Who are your key source markets currently? Primarily from the GCC followed by the rest of the Middle East and then Europe. What are your marketing and promotions plans for the property moving ahead into 2014? We have in place a complete sales and marketing plan for the property including a focus on the corporate business, the FIT, long term and meetings. We will continue with our aggressive approach and use all channels to drive the business, whether regionally or internationally. What is the hotel’s USP? Majestic Arjaan by Rotana is conveniently located in Busaiteen district in the island of Muharraq, only a few minutes from the city of Manama. With the opening of this hotel, Rotana is now operating its 11th property under the ‘Arjaan Hotel Apartments by Rotana’ brand.